From Photoshop to Office and beyond, here are five powerful things you might be surprised to learn you can do with a Chromebook. Adobe and Google recently announced they’d be making Photoshop available as a streaming Chrome app. This means Photoshop will work on Chrome OS, and even in Chrome on desktop Linux! To do this, the Windows version of Chrome will run on Adobe’s servers and be streamed to your Chrome web browser. It sounds unnecessarily complicated (and means an Internet connection is vital), but Photoshop is actually such a demanding application that this could be useful. When you use demanding functions, they can be sped up because they’re running on Adobe’s servers—they won’t drain your laptop’s battery faster or send modest Chromebook processors screaming. Photoshop will be integrated with Google Drive, so you can easily keep track of your files. Currently, this feature is in beta and available only to “select North America based Adobe education customers with a paid Creative Cloud membership.” But it should eventually come to all Creative Cloud subscribers. Microsoft likes to trumpet how Chromebooks don’t have the full desktop version of Microsoft Office, and that’s true. But unless you’re an accountant, you probably don’t need all those fancy features. Microsoft offers a completely free web-based version of Office called Office Online, complete with Word Online, Excel Online, and PowerPoint Online. Microsoft even makes these apps available in the Chrome Web Store. These web apps aren’t just for Chromebook users, though. 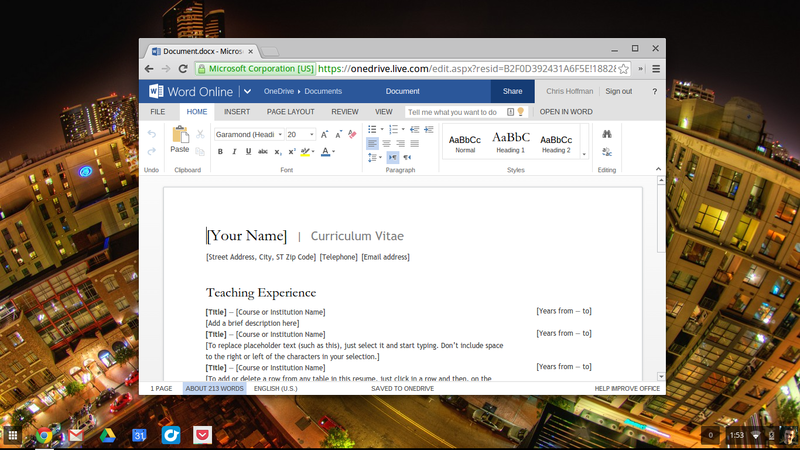 Windows users could use Office Online to get an official Microsoft Office experience for free, and they let desktop Linux users use an official version of Microsoft Office without hacking around in Wine, too. The Word Online web app in Chrome OS. If you tried Microsoft’s “Office Web Apps” in the past and weren’t crazy about them, give them another try. Reborn as Office Online they’ve been much improved. Compared to Google Docs, Office Online doesn’t offer any offline support, which is a bit of a bummer. But it does provide a familiar interface and more-or-less guaranteed compatibility with Microsoft Office documents. It saves those Office documents to OneDrive, where you can access them using Office apps on any other device—even the full desktop version of Office on your Windows or Mac. 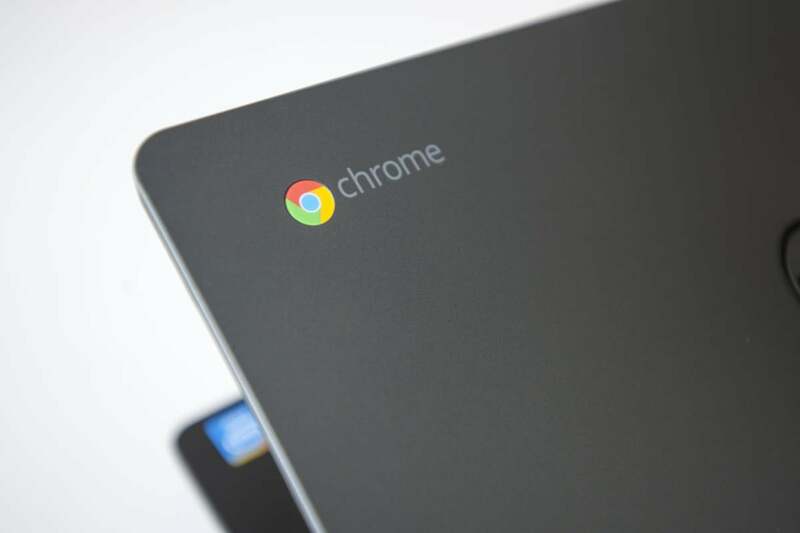 Google is working toward allowing all Android apps to run on Chrome OS. They recently released just four Android apps for Chrome, but enterprising hackers (the good kind) have found ways to make (almost) any Android app run on a Chromebook. 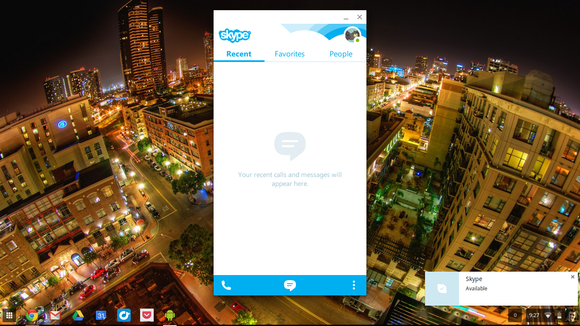 Yes, this means you can now use Skype on a Chromebook. The Skype Android app running in a Chromebook, complete with system notifications enabled. This is becoming easier all the time. You can now use the ARChon Package app on Android to quickly convert an Android app to run on Chrome, or install the twerk Chrome app to quickly package an APK file for installation in Chrome. This feature is very likely to keep improving, so apps that don’t work perfectly now should eventually work better. When Google is done, Chromebooks will be able to access a whole new universe of software without any hacks whatsoever. Yes, you can work offline on a Chromebook. Read your Gmail and compose new messages? Sure. View your Google Calendar? No problem. Edit documents in Google Drive? You got it. Setting up some of Chrome OS’s offline capabilities. Beyond the basics, you can download Kindle eBooks, videos, music, and PDFs to view offline. 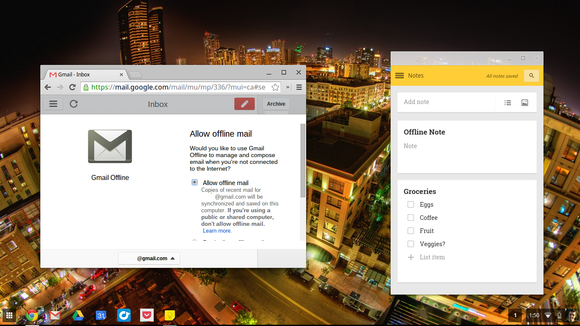 Use a Chrome app like Google Keep to compose notes or manage your to-do list with an app like Wunderlist or Any.DO. You can even purchase TV shows and movies from Google Play Movies & TV and download them to watch them offline, too. If you just want to kill some time, you can also install games that run offline. Sure, many things on a Chromebook can only be done online, but let’s stop pretending that’s unique to Chromebooks. It’s 2014, and even a Windows or Linux laptop feels practically unusable when there’s no Internet connection available. And, in Chrome 39—which is still working its way through development versions, so you probably won’t have this feature yet—you’ll be able to play an endless running game whenever you see an “Unable to connect to the Internet” page. This last feature isn’t for the novice users that just buy Chromebooks for their simplicity. But this is World Beyond Windows, where I tout the benefits of Linux, so I can’t leave it out. Flip the developer mode switch (it’s in software now, but it used to be a hardware switch) and you can get full access to your Chromebook’s internals. You can install a full desktop Linux system (like Ubuntu) alongside your Chrome OS system. Flip over to the Linux system when you want to do some work with traditional desktop apps and powerful terminal commands. Steam for Linux running in Ubuntu running on a Chromebook. Softwareception! 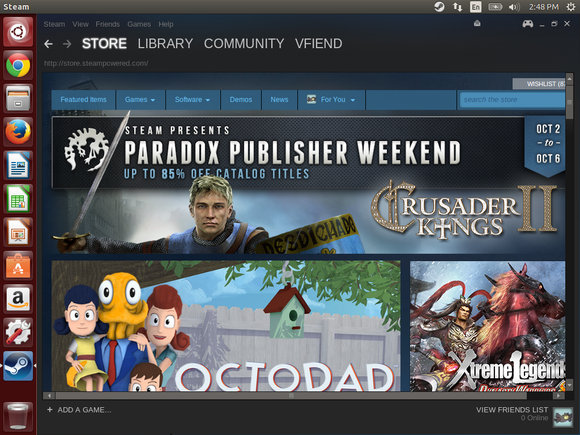 Or, even better, install Steam for Linux and play games—as long as you have an Intel-based Chromebook and not an ARM one, that is. Or, with Steam in-home streaming, you could run those games on your gaming PC and stream them to a Chromebook running Steam for Linux. You could also install other Linux applications like Minecraft and Skype for Linux, both of which are now Microsoft applications. Yup, Microsoft makes Skype (and now Minecraft) for desktop Linux, but not Chrome OS. MakeUseOf has a great primer on installing Linux on a Chromebook if you’re curious. The list of things a Chromebook can’t do is shrinking rapidly. 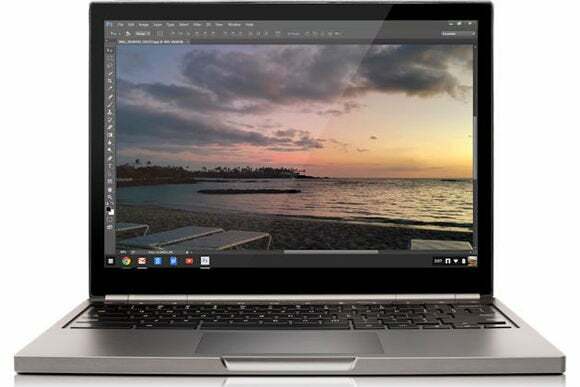 Recent advancements like Chrome apps, Android apps on Chromebooks, and Photoshop for Chrome OS show Google is serious about evolving the platform. It can all seem a bit messy—shouldn’t developers be making Chrome apps and not Android apps?—but it’s undeniably making Chromebooks more powerful and capable.